The Lyles Center for Innovation and Entrepreneurship welcomed more than 30 community college faculty members from across California to Fresno State to participate in the inaugural Community College Entrepreneur Pathway training, March 5-7. 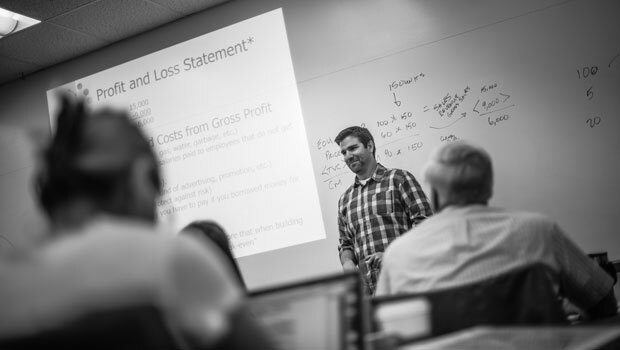 Created by the Lyles Center, the training is designed to help faculty deliver entrepreneurial education to students. Participants had the opportunity to explore classroom tools, take part in hands-on exercises and complete subject-based projects highlighting entrepreneurship. Attendees learned how to effectively teach entrepreneurship and how to access support from a state-wide community focused on entrepreneurial education and development. Led by Dr. Timothy Stearns, executive director of the Lyles Center, Eric Nasalroad, Entrepreneurship Center director at Reedley College, and Matthew Alanis, business instructor at Clovis Community College, the training concluded in a certificate ceremony on Saturday, March 7. Community college students who take a course based on the Community College Entrepreneur Pathway curriculum are eligible to receive three units of entrepreneurship education upon transferring to Fresno State. For additional information, contact Dr. Timothy Stearns at 559.278.3735 or timothys@csufresno.edu.